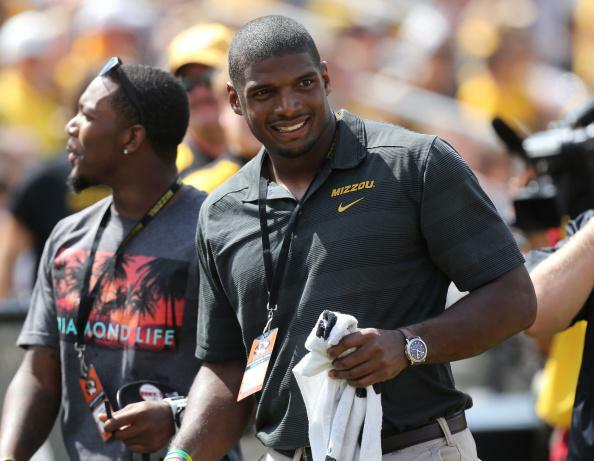 Michael Sam, Cowboys: Defensive end signs with team's practice squad. Sam on the sidelines of last weekend’s University of Missouri football game. Update, September 3, 11:45 a.m.: ESPN reports that the Cowboys have officially signed Sam. Cowboys plan to bring Michael Sam to Dallas for a physical Wednesday, per team source. If all goes well, Sam will be a Cowboy. To be clear, Dallas would like to sign Michael Sam to practice squad, not active roster. First things first. Physical Wednesday. Sam will be joining a Dallas organization owned, run, and embodied by Jerry Jones, an oilman and certified Big Personality whose proclivity for headline-making moves has helped keep his team in the national spotlight despite a long run of mediocre on-field performance. Slate’s Hang Up and Listen podcast crew discussed Jones in a podcast posted today for an entirely non-Sam related reason, namely his open admission to an ESPN reporter that he really wishes he could’ve drafted Johnny Manziel, the Heisman-winning quarterback whose own Big Personality and mischevious, improvisational playing style made him a national fan favorite in college. (Many NFL types worry that Manziel is too short and too headstrong and too blah blah blah Let’s Crush Everything That’s Unique in the World Into A Joyless Gray Porridge—to succeed in the NFL. Jones’ own advisors talked him out of taking Manziel.) The watchword for (usually anonymous) NFL sources who said Sam wouldn’t make it in the league was that he would be too much of a “distraction” to his fellow players and coaches. But in Dallas, distractions are company policy. In Sam, Jones has found a player that will not only make headlines but could also legitimately address an area of on-field need. The team lost star defensive lineman DeMarcus Ware in the offseason, and even before Ware’s departure, the line did a poor job of attacking opposing quarterbacks, finishing 25th out of the league’s 32 teams in quarterback sacks. As alluded to in the Schefter tweet above, Sam has shown early promise as a professional pass rusher, and in college last year he led the highly competitive Southeastern Conference in sacks. In fact, during the preseason Michael Sam sacked Johnny Manziel twice. One imagines Jerry Jones was watching. Update, September 2, 7 p.m.: As writer Dave Zirin points out, the Cowboys have a unique arrangement with the NFL that allows them to keep all their merchandising revenue rather than sharing it with other teams, and Michael Sam jerseys have been selling very well even during the preseason. So that’s one more piece of upside for Jones. Correction, September 2, 9 p.m.: The headline of this post originally misstated that Michael Sam had signed with Dallas; Adam Shefter reported that Sam would sign if he passed a team physical.